Seeing how I visited Minake recently and have only 2 more Japanese restaurants left in the area of the Newton Wave Pool, I decided to knock off another today. 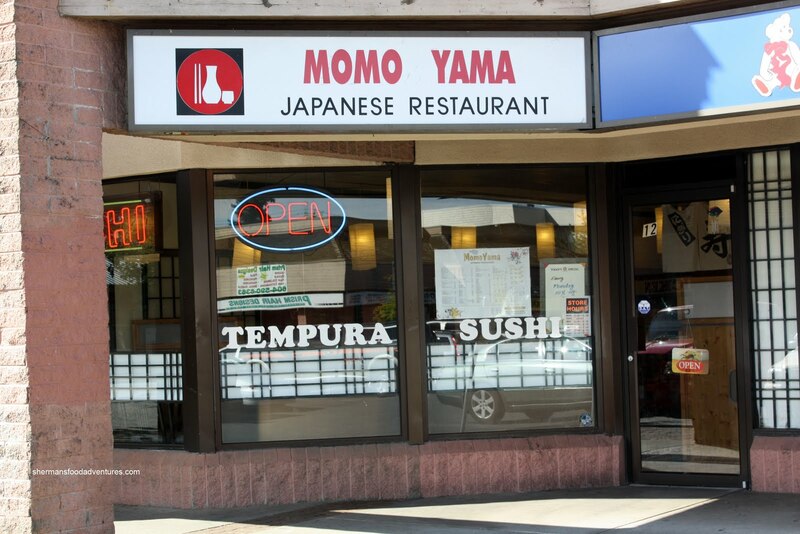 Since I've already been to the Scott Road location of Toyko Sushi Express already, the natural choice was Momoyama. 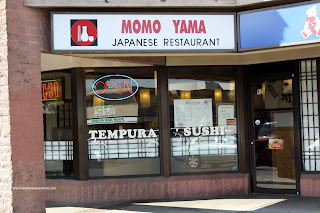 Located in the plaza across the street from Minake, Momoyama is one of many restaurants which include C-Lovers, India Gate and Lee's Chicken (yay!). Yes, no need to head all the way to Abbotsford for Lee's Chicken anymore! This one is "relatively" closer. As a side note, this area is terrible for those wanting to turn left into a plaza. You just can't. Either you have to be lucky enough to be traveling in the right direction or you have to literally go around on a scenic drive to align yourself going the right direction! I think practically every time I've been in the area, I've made a U-Turn somewhere to get to my destination (well, not in front of the cop shop though!). Fortunately, this plaza had a side entrance once I made a left, so no circling around this time! I ended up with the Deluxe Bento Box in order to try out a variety of items. Normally, most bento boxes include an Ebi Sunomono and there is very little difference between all of them. So imagine my utter shock when I was presented with the bowl you see in the picture. If the 10+ pieces of shrimp weren't enough, there was a sushi ebi to top it all off. Unfortunately, the vermicelli underneath was super soft and warm. Furthermore, it was sweet with very little tang, I had to use the lemon to make up for it. Although, I do give them kudos for the massive amount of ebi. Included in the combo was a full size Dynamite Roll. It was indeed large and topped with a large amount of tobiko. 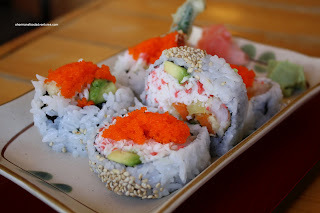 With very little rice on the outside and a large amount of surimi and a crunchy ebi tempura, the roll was not bad. I would've liked that the rice wasn't so gummy; but it wasn't too bad. The rice itself did have some flavour; yet ever so slightly. 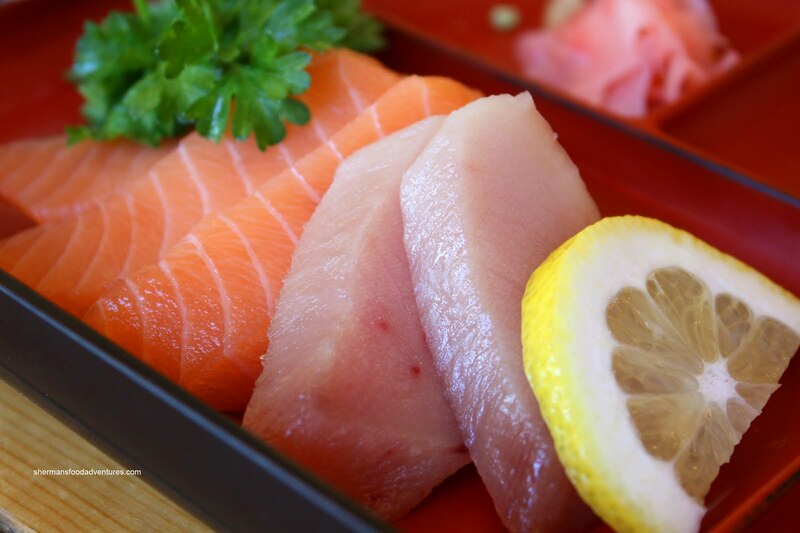 The Sashimi consisted of salmon and tuna. The salmon was fine; but the tuna was not. Still frozen and icy, I ate one and left the other to thaw. Even leaving it to the last thing I ate, the tuna was still frozen. Imagine frozen and mushy at the same time. Not good. 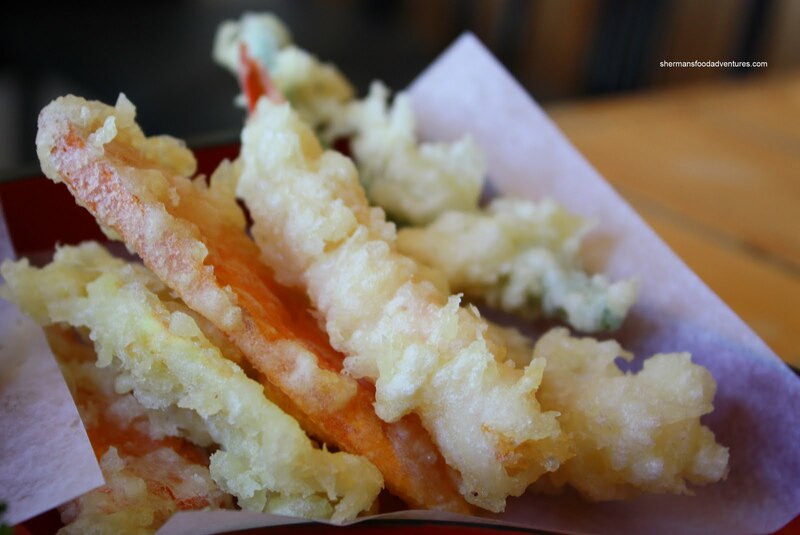 The Tempura was not much better. With globs of batter on the exterior of most pieces, I had to physically remove the batter to eat it. Otherwise, I got chunks of doughiness mixed in with slightly crunchy bits. The green bean was particularly confusing. Not sure how they got a glob of batter to adhere. It looked like a growth or something. 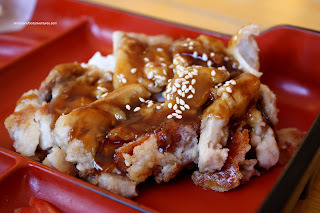 On the topic of doughy, the Chicken Teriyaki was subpar. The flour coating was not crisp at all; rather, there were mushy parts abound. It was like eating pieces of chicken with unmixed roux attached to it. On the positive, there was plenty of tender chicken. Furthermore the sauce was not too overpowering. This was one large combo! I didn't even include the 3 pieces of Nigiri... 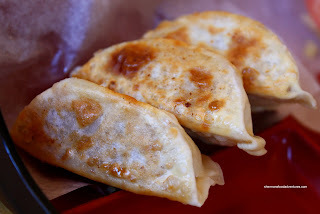 There were also 3 Gyozas! These confused me though. They were definitely not fried gyozas; however, they seem to try very hard to be fried. The wrapper was hard and dry from top to bottom. Although I did appreciate that it was thin. As for the filling, it was mealy and flavourless. Although the meat filling was cooked, it had the texture of uncooked pork. I'm okay as I write this, so it was cooked. I was barely able to finish all the components of this bento box. There was so much food. Considering that it cost exactly the same price as the combo I had at Minake, this was a much better value. Now, in terms of execution, there was a lot to be desired. I think there was an issue with every single item. Not a ringing endorsement... 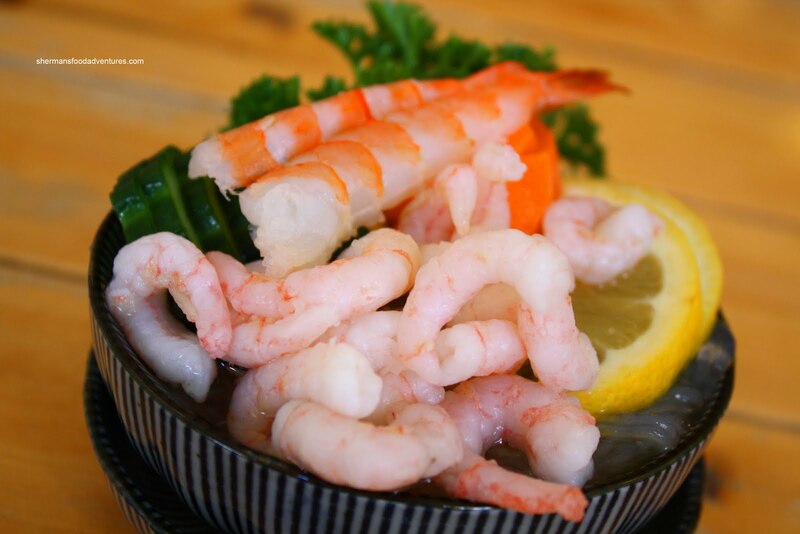 Yet, if you are looking for a decent value and food that is edible, Momoyama is still an option. You must remember that I've been to many Japanese restaurants and I may just being picky. Now that you have basically completed the Newton Tour de Sushi, Which would you say was the least bad? Or, to rephrase the question: Which one would you venture back to 1st? Again, thanks for all the great info, you make working in Newton less terrible...And living /eating in Vancouver awesome!!! Thanks for reading again Drew! In terms of your question, I'd probably do Kyoto first. There is some decent eats out in Newton, you just have to look for it!